Although statistics demonstrate how widespread bullying is, incidents often go unreported. Embarrassment, fear and not wanting to get classmates in trouble are likely reasons, but also because students don’t always recognize that they are being bullied, or being a bully. Interrogation and punishment are traditional ways of dealing with bully behaviour. But many IB World Schools are finding that an open and honest discussion between students is key to help them identify and tackle bullying. The IB Learner Profile attributes of being caring and principled emphasize the responsibility of all students to act respectfully and be understanding of one another. But students are also using their effective communication skills to reflect on past actions, using what they learnt to diffuse a situation before it escalates in future. They’re taking risks, mustering up the courage to candidly discuss this difficult topic. Grade 6, 7 and 8 students at IB World School Prem Tinsulanonda International, in Thailand, recently held a three-day workshop to highlight the effects of bullying, recognize the harm it causes, and discuss strategies to stop it. “This is the most proactive way to tackle bullying,” says Amandine Lecesne, Whole School Counsellor. “It gives students strategies for identifying bullying when it happens and getting help to combat it. It also raises the level of empathy students have towards one another. Having an open and dynamic dialogue all year-round about the subject is important. Grade 6 students watched a short student project about the effects of bullying, while Grade 7 and 8 students watched the “To This Day” graphic poem, by Shane Koyczan, who recalls his experiences. Learning about the long-lasting effects of bullying encouraged students to share times when they had bullied someone and consider how the target felt. They wrote heartfelt pledge letters reflecting on their actions and what they promise to do differently in future, such as: “I will never make someone feel sad or irrelevant,” “I promise to use my words to cheer people up, not to make them feel bad,” “I am not proud of my past words and actions and from today onwards, I will promise that my words will only be used for happiness and kindness,” and “I will be more responsible with the power of my words”. 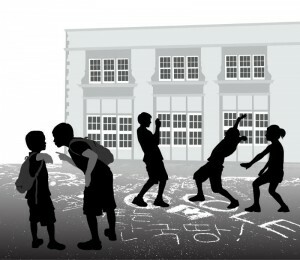 “Students also explained what it felt like to be a target. They noted what they would say to bullies if they had no fear. These messages are now displayed outside the school library, alongside information about bullying. The exercise helped students recognize that bullying is more than physical actions and mean words”, says Lecesne. The workshops have given students the opportunity to reflect on the power of their words and how important it is to use that power for kindness. At Fountainhead School, in India, bullying is regularly discussed in life skills class. PYP students wrote letters to bullies, or victims, to express their feelings, too. As part of these classes, they learn about sexuality education, gender roles, self-esteem and stereotypes, which all help shape their response towards negative situations that may arise. Escuela Bilingüe Internacional (EBI), California, gives PYP students the autonomy to solve problems amongst themselves, with adult support. The school works with No Bully, a national non-profit organization, to train and guide teachers through a series of interventions. When a bullying incident happens, a Solution Team of students come together to appeal to the perpetrator’s empathy. The team includes the bully, the bully-followers and positive leaders from the peer group. A Solution Team Leader (educator) asks the team to solve the bullying and provides guidance as needed. The Solution Team Leader then directs the students through two structured follow-up meetings; the target typically attends the second meeting. If students are in conflict, EBI teachers help them talk it through before it escalates. They use a No Bully process called TALK, which stands for Tell what happened and how you feel, Ask for what you need, Look for solutions, Keep the best solution. Honest and open discussions about bullying empower students, and ensure incidents are reported and dealt with appropriately. “In order for students to identify bullying, it is important for them to first understand the correct meaning. Students who know what bullying is can identify it better,” says Fatema Maskati, counselor at Fountainhead School. Encourage students to answer questions asked during discussions honestly. There are no right or wrong answers. Assure them that they are not alone in addressing any problems that arise.